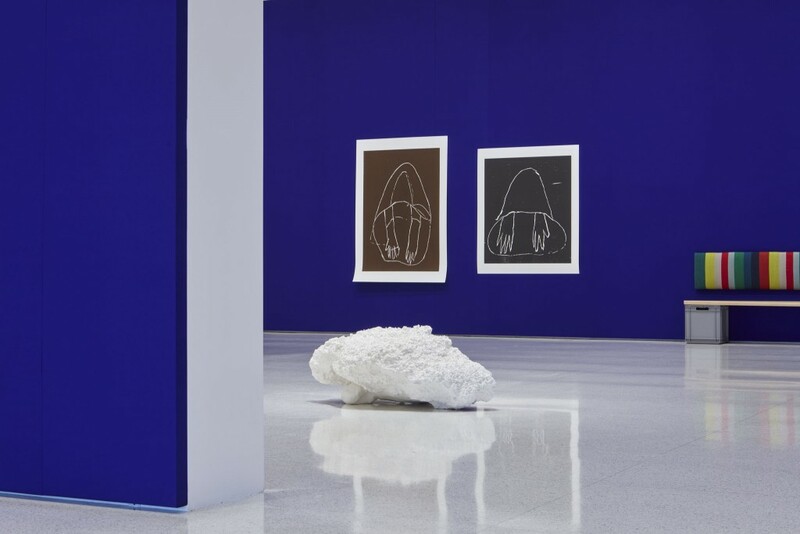 Despite the bright blue fabric walls that, at first glance, seem to make a bold declaration of sorts, Andrea Büttner is an exhibition that operates at a quieter level. It is an exhibition that seems to ask for little more than patience, curiosity, and close looking, and in placing such a premium on the activities of the viewer, confers an equal footing to artistic production and reception. Perhaps not in the sense of calling for an active form of looking, as in the need for the viewer to “activate” the piece (the works are all of a passive nature, and I mean this with the greatest regard), but rather her practice seems to respond to a careful and thoughtful type of looking. It is in this realm of psychological safety, where the artist trusts the viewer and the viewer trusts the artist, that Büttner inserts supposedly small or shameful subjects into the space of the gallery. From mosses that grow close to the earth (humus in Latin) to beggars who also lower themselves to the ground in supplication, Andrea Büttner offers a meditation on the aesthetics of humility. Limestone with moss (2015) is a limestone rock covered in a variety of mosses native to Minnesota. Moss, as the artist points out in an adjoining work, was deemed a “lower plant” among early botanists (in comparison to “the higher, or perfect, flowering plants”). In fact, it is still widely considered a primitive plant form, as evidenced by the fact that it is often described by what it lacks: flowers, fruits, seeds, roots, and apparently any basic internal vascular system that would enable it to conduct water. Yet, by placing a moss-covered rock in the middle of the gallery, Büttner prompts the viewer to bend down and appreciate the multi-faceted beauty of mosses—the fine threads of these tangled green tapestries, the softness and sponginess that seem to demand touch, or simply that a living, breathing organism currently resides in the white cube of the museum. Moss, in Büttner’s hands, becomes not something to discard or trample on, but rather something with which to engage, or at the very least, take notice of. Similarly, two large-scale woodcuts of hooded beggars introduce the perhaps shameful act of seeking charity into the gallery. Fittingly, the German expression “Ohne Moos nichts los,” or “without moss you don’t get anywhere,” connects the two works in question (moss serving as a metaphor for money). Here, Büttner introduces another supposedly dirty concept into the space of the gallery—money or the solicitation thereof. Yet, the brown inked background of one of the woodcuts evokes the brown habit associated with St. Francis of Assisi, a frequent reference for the artist, who renounced his wealth and imbued poverty with a spiritual virtuousness. In Büttner’s presentation, then, the beggars suggest a holy dignity as opposed to an earthly desperation. In both instances, moss and beggars seem to languish in the spotlight. The moss curls into itself, as if shielding itself from the bright light of the gallery (a far cry from the damp, darkened spots in which it prefers to flourish). The beggars, too, fall to the ground, pulling their hoods entirely over their heads. Yet, despite the urge to hide, both maintain a level of vulnerability out of a necessity, if you will: the moss, though naturally conditioned to roll inward due to the absence of moisture, exposes its green shoots, as if asking for water, and the cloaked beggars with their bare forearms, money. Whether seeking water or money—or, more broadly, patience and time—Büttner’s work seems to ask another party, the viewer, for mercy. Seen in this light, the bright blue walls, which hug one another at a perpendicular angle, can be attributed to another gesture of generosity—specifically, that of bringing attention to an often overlooked part of a room, the corner. Nestled into this corner are three Benches (2012) constructed of planks of wood placed atop plastic crates. 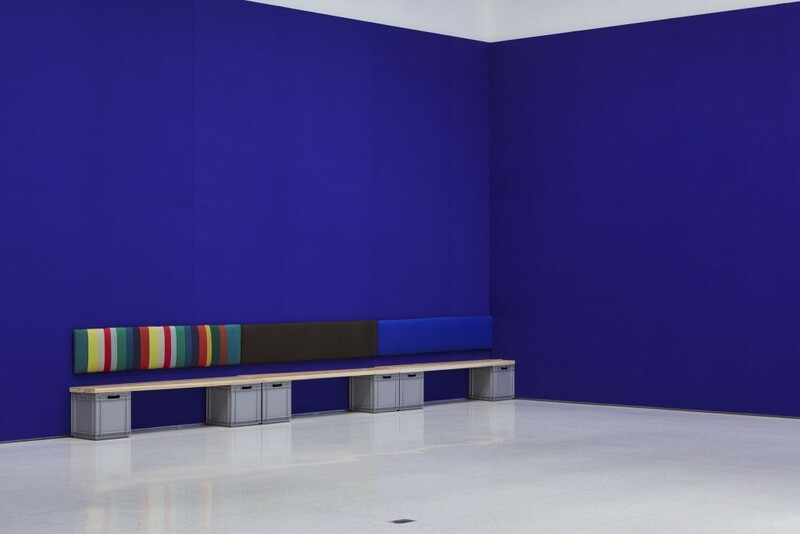 These benches offer the weary museum-goer a moment of respite, a place to rest her feet. 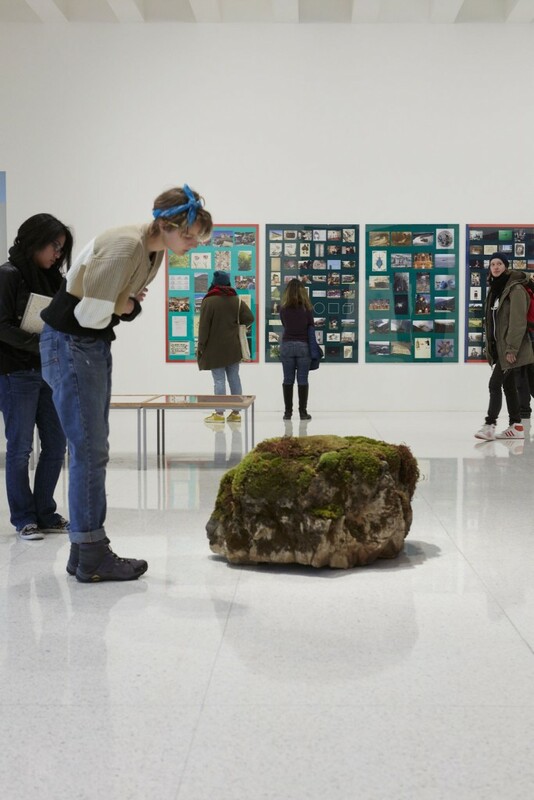 In the case of Andrea Büttner, then, mercy is reciprocal—between artist and audience, production and reception—ultimately demonstrating Büttner’s tacit acknowledgment that symbiosis (as in the relationship of moss to nature, or beggars to society) is a necessary, and welcome, condition of art making.